Baked crispy barbecued pork buns (雪山叉燒包) - these char siu baos were pretty decent. Deep-fried chicken pieces with home-made shrimps sauce (大澳蝦膏炸碎雞) - yeah, baby! Gimme some of this any day! The shrimp paste covering the pieces of fried chicken is so deliciously addictive, I really couldn't care less about the chicken they used... Definitely a very greasy dish, so the raw cucumber sticks on the side provided the necessary relief and refreshed the palate. 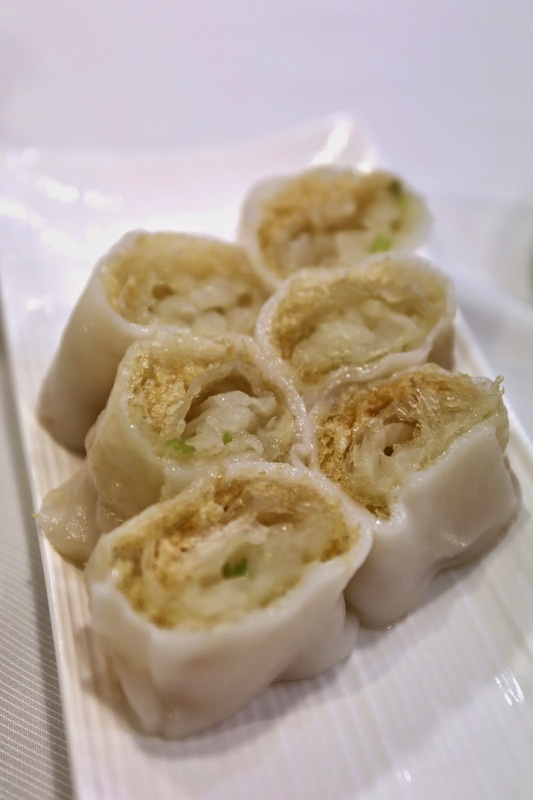 Steamed rice flour rolls with spring roll (金包銀絲腸) - this is something that their neighbor Sun Tung Lok (新同樂) does really well, and the version here fell a little short. But it was still really satisfying to bite into these and feel the crunch from the crispy bits of spring rolls. The strips of radish provided some juicy softness in contrast to the crunch. Yummy when drizzled with soy sauce. We were satisfied with the delicious food, and it was time to get the check and go. I looked for a waitstaff and raised my hand. No one saw me. There were 8 or 9 of the restaurant's staff within view, and this wasn't exactly a basketball court or a football pitch. From the manager down to the bus boy, they congregated together but somehow no one looked in my direction. Finally, it took the most junior staff coming out from the kitchen to see that I had my hand raised. No tip today, then... Not.one.dollar.